Fireworks burst over Ada’s Wintersmith Park Saturday. 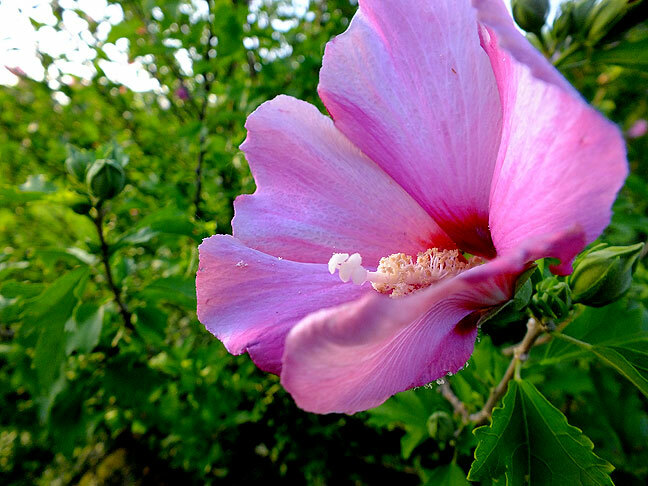 Despite the fact that our Rose-of-Sharon bushes are near the end of their lives and need to be replaced, we are still seeing their beautiful blooms this summer. Saturday was Independence Day, and as always, I worked the events. 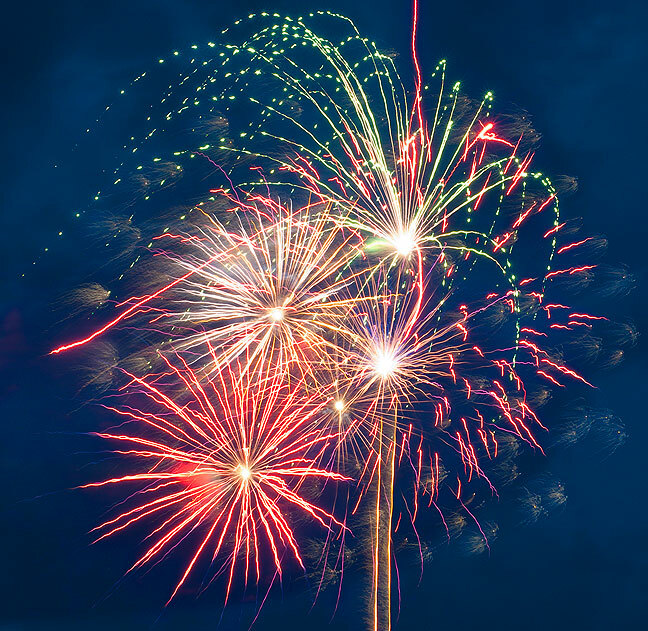 I always have a good time photographing everything on July 4, since it always makes pictures. Yesterday my wife Abby and I had a Johnny Depp movie marathon. We saw Edward Scissorhands, Benny and Joon, and From Hell, selected because she wanted to own Edward Scissorhands and the Amazon.com DVD special was for a triple feature. Benny and Joon was the best of the three. We have several more, and I am particularly interested in Fear and Loathing in Las Vegas. We have a tenuous connection to Johnny Depp; he recently attempted sign my great-niece-in-law Allie’s flip-flop, but when that didn’t work, he said, “Sorry, love,” and signed her arm instead. Nice guy. Lunch while I watched these films was all-fruit: grapes, bananas, and apples. It reminded me of an all-fruit lunch I had many years ago with Michelle Bullard. She and I were dating at the time, and we decided to get every fruit we could find at the grocery store, sit under a tree at a local grade school, and have a festival of fruit. I don’t know if she ever remembers doing that, but I thought it was a great moment. 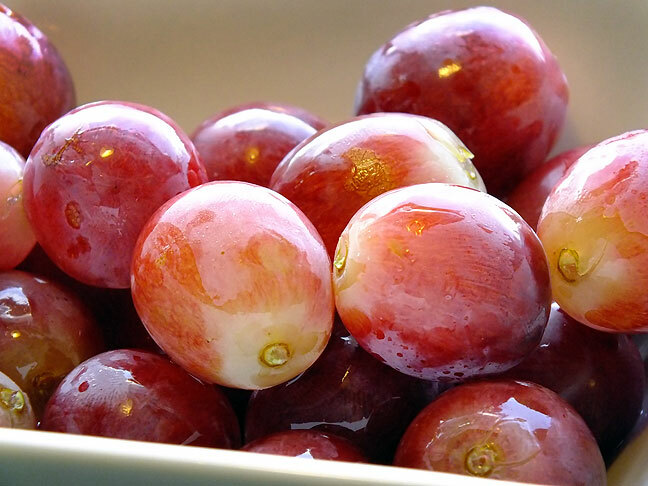 I found these grapes at Wal Mart Saturday, and thought they looked good for lunch yesterday. I was unaware at the time that grapes figured prominently in the plot of one of the movies we watched. 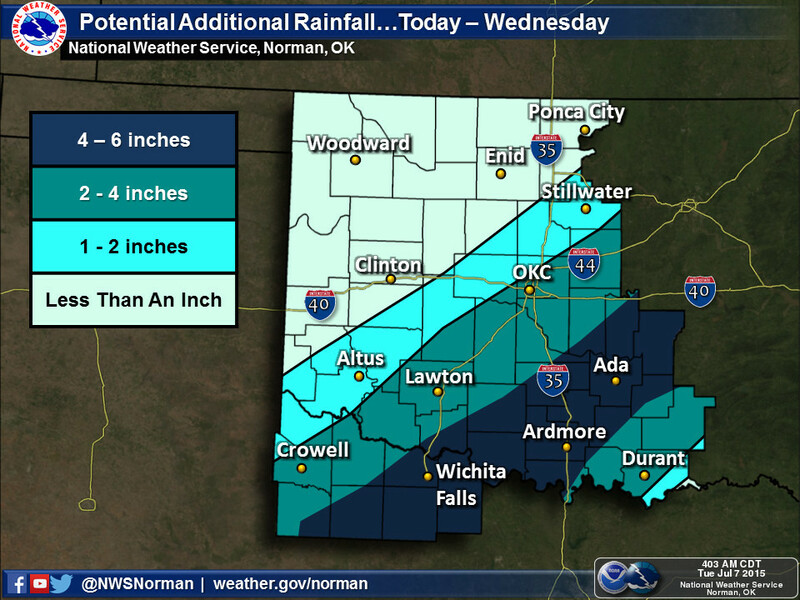 We could get another six inches of rain. Michelle and I have remained good friends after all these years, and I am friends with her companion, fellow photographer Matthew White. The two just moved to Huntsville, Alabama, where Michelle got a new job at the George C. Marshall Space Flight Center. By evening yesterday, Abby fell asleep in her recliner, and I, aware that our patch here in southern Oklahoma could get even more rain, mowed all there was to be mowed, weed eated (which Abby and I debated – is having used a Weed Eater [which my string trimmer is not] “weed eated” or “weed ate”?) all I could before daylight ran out. 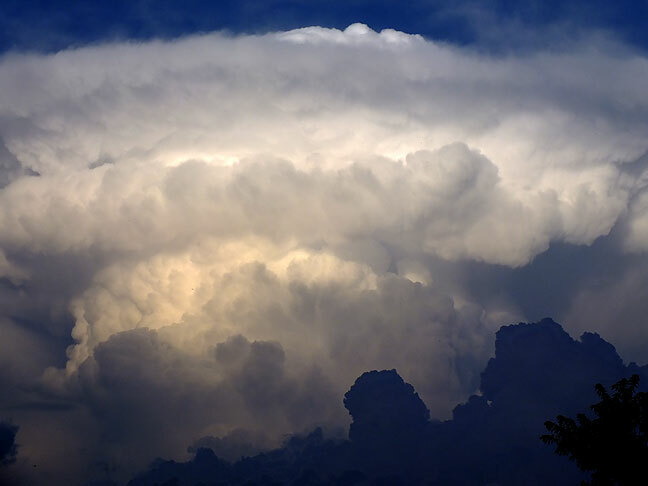 Cumulonimbus clouds billow east of our home recently. We could expect more rain today and tonight. 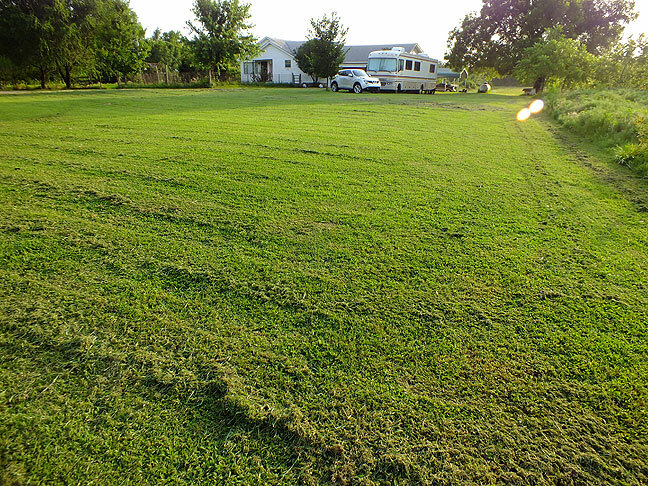 I love the way the yard looks right after I mow it, in evening light. It looks like a green and gold carpet. My readers know that caring for our green patch of land here in the country is genuinely fulfilling, particularly because it is so beautiful and photogenic. Last night in the middle of the mowing and trimming, I grabbed a camera and made some images in the golden hour light. 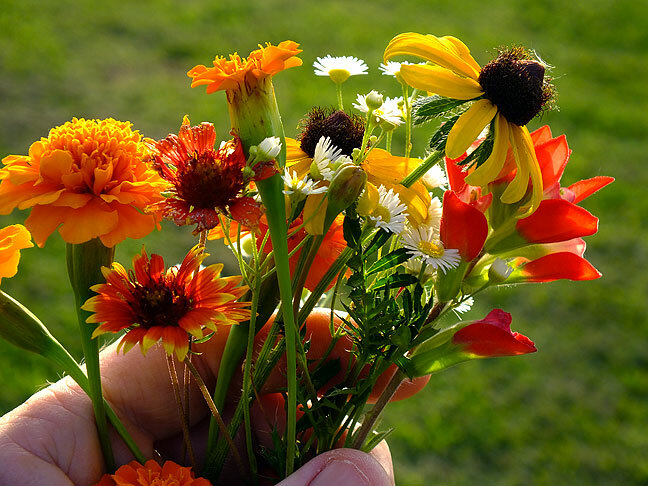 I also gathered a few of my marigolds, the only thing left in the garden, and some wildflowers, and arranged them in a coffee cup and left them for Abby, who by dark had gone to bed. When she saw them, she smiled and thanked me. This is the arrangement I offered my wife last night. When she discovered them by her bedside, I told her there will never come a time when I don’t bring her flowers. I remember Fear And Loathing In Las Vegas having a tremendous effect on me the first time I saw it. When I watched it again a few years later, nothing happened. I must have seen it the first time at the exact correct point in my life. I was a different person by the time I saw it again. I generally love Depp’s work, but recently saw “Mortdecai” and was hugely disappointed, despite an amazing supporting cast including Paltrow, Goldblum, Bettany, and McGregor.